So the results are available and already making news. Well, some of it is making news. In the spirit of Lies, Damned Lies and Statistics, let me lay out the actual figures for religion, taken from the ONS. For England and Wales, of course… sorry, the rest of the disunited kingdom, your voice is not heard here. I’ve not listed those who did not declare a religious affiliation such as atheists, humanists and jedi (hmm, discuss…). The census return was one form per household. The form was to be completed by the ‘head of household’ which could provide fuel for a massive argument in many a household but… how was the count determined in multi-faith homes (like mine)? 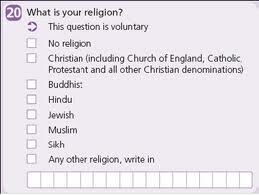 Was the questionnaire simply filled in with the religion of the person completing the form? I expect so. I wonder how many more pagans there would be if it was an individual return? These figures are interesting, but, as you say, questionable. If 80,000 is reasonably accurate, this means we’re approaching the same order of magnitude as Buddhists, who are now only about 3x as many as us. The Christian category aggregates wildly differing denominations and will include many nominal C of E, of course. Pagans ( of almost equally diverse hues? ) are about one in every thousand of the population then, and one to every 415 Christians. But at a few hundred in a Metropolitan Borough or City of a few hundred thousand, this is still a long way from mainstream.